While today was an insane day on Wall Street with no one seeming to know anything about why there was so much volatility (Crisis in Greece, Banking Reform, etc. ), there was one person who knew all along what would happen. If we would have just listened to her years ago, all of today’s anxiety could have been prevented. 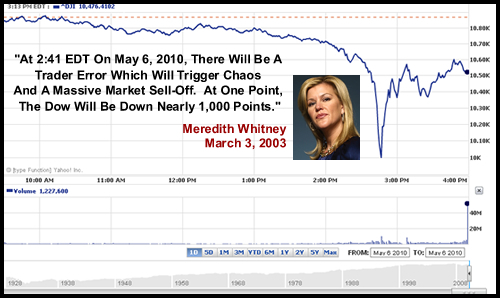 The brilliant Nostrodamus of Wall Street knew years ago this would happen (as evidenced by the dated quote on today’s stock chart). Now, I’ve been pretty tough on Ms. Whitney over the past few months (i.e., here and here) – but this is undeniable proof that she really does know what she’s talking about and we’re all idiots for doubting her. From now on, whatever she says – no matter how ridiculous -should be writ in stone. Alley Insider allthingsd Ari Emanuel bank regulations Benjamin Swinburne Bloomberg BMO Capital Bulgarian Proverb CNBC Credit Suisse David Blaine Deadline Hollywood Dom Perignon Earnings Report Erin Burnett Femme Aux Bras Croises Glenn Vogelman Goldman Sachs Greycroft Partners Henry Blodget Ian Sigalow Jeff Weiner Jeff Zucker Jeffrey Logsdon Jessica Reif Cohen Jill Kennedy Khan Manka Lehman Brothers Lynn Tomasson Manka Bros. Maria Bartiromo Meredith Whitney Meredith Whitney Advisory Group Merrill Lynch Morgan Stanley Nikki Finke Nostrodamus OnMedea Oppenheimer & Co. Picasso President Obama Sarah Michelle Gellar Scott Brown Silicon Alley Insider Spencer Wang stock market glitch Terry Semel Uri Geller Vijay Jayant World's Largest Media Company Yahoo! I think this posting is a lie! I don’t believe the quote is correct. 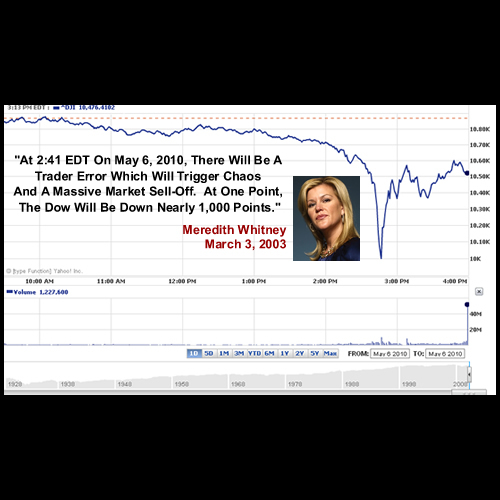 In addition, it wasn’t a trader error, there’s no evidence of that. Ha, the entire site is a BS waste of time. Not funny dudes. Welcome back, Jill. Good vacation? The financial world seems to be collapsing. Though maybe since a glitch may have been partially to blame it’s not really as dire as it seems. Now if she will just predict that my house will lose another 20% of its value I’ll be the happiest person on earth! Everybody makes predictions on every channnel on every website including this one. Why you pickin’ on poor lil’ ol’ Meredith? She’s just as good as all the others. Ivy league with an MBA huh? You mean like Timmothy Geithner and Larry Summers and Barry Hussien Soetero? You must be a whiz. I bet you “whizzed” your way into some puny-dork’s trust fund while at the Ivy League. Relaxxxxx babe, I’m just giving you a hard time. Don’t get so worked up. Everything is going to be fine the market will be back at 11,000 tomorrow, the volcano will stop erupting, the Euro trash in Brussels will turn on the printing presses, Grease Papeodrou’s palms, place an excise on Porto being shipped to China, get Spanish Bullfighting on American ESPN, kick the Moors out of Italy, and Von Rompuoy will go to Eire and kiss the Blarney Stone many many times and thus the New World Socialist utopia will be born, and you my fair lady will be one of the few jet-setting elites, taking safaris in Africa with Bill Gates and George Soros. sounds good to me, Adam. I know I’m just a blonde – but is Barry Soetoro’s middle name really Hussein? Ms/Mrs. Kennedy, That is a question that I don’t think we will ever know the answer too. Most likely not in my opinion because you have to be born a Muslim to get named the name “Hussien.” Soetoro seems to be a very “worldly” character judging from his actions and words. He seems to be with the “Do as thou wilt” camp. Lets be honest here, you have to be dirty to get anywhere in politics and very dirty to get to the tippy top (the Chi)… judging from what I’ve seen in my short life. You are more than just a blonde Ms/Mrs Kennedy, you are a blonde with an MBA, a story, and a blog, which I think is awesome. I’m sorry to come out swinging at you like that, I had to test the waters here. I like how you tie Medea in with your blog, it shows your not all business-minded and you make time to appreciate other subjects, but something tells me you are a very smart woman in many subjects. It doesn’t look like your blog is getting many hits. You need to hire someone who knows marketing and advertising. I guess my prediction that the market would be back at 11 didn’t come true. Dom Pérignon’s vintage bottles serve as the prestige Champagne for Moët & Chandon, one of the world’s largest and most prominent.